The party rolls on with this Louisiana supergroup’s second independent release, where mastery of Cajun, zydeco, and swamp rock is on full display. The Revelers -- Chris Miller, Daniel Coolik, Chas Justus, Eric Frey, Glenn Fields, and Blake Miller -- are in the unusual position of starting over after having experienced a modicum of success and generated national awareness in their previous incarnation. All but Chris Miller were members of the the Red Stick Ramblers, a band that reached a widespread audience of New Orleans music fans through appearances on Anthony Bourdain’s No Reservations and HBO’s celebrated series Treme. That decade-old band called it a day in 2013, by which time the Revelers’ eponymous debut album had already been recorded. 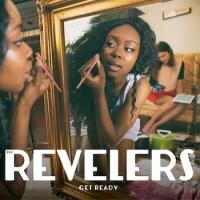 Get Ready is the Reveler’s second collection of original material and it finds the group ready, willing, and able to rock the house. The Revelers’ brand of New Orleans music is a masterful mix of Cajun, zydeco, and '50s inflected swamp rock, featuring all new compositions that capture the spirit and drive of their stylistic origins, and it is presented by a band of musicians playing at the top of their game. The 11 cuts on this album pass by with the connectedness of a set in a backwater bayou bar, a place where the locals can let go and sashay late into the night. The band offers just the right mix of fast and slow, balanced but always driving forward. The production is crisp throughout; this is a sonically clean album that sounds good in the car or on home speakers, but one senses these songs are best heard from a stage. The band is on the road throughout the summer, all set to dirty up the sound a little bit as they conquer assorted halls and honky tonks between Oregon and Maine. Based on the evidence of this album, I’d recommend catching them if they hit your town.